One of the most important aspects of a new build is to ensure that future occupants will be safe in the case of an emergency. Fires are the most unpredictable disasters that can strike a structure, causing damage from smoke and flame as well as the potential to claim many lives quickly. This is why commercial fireproofing is an important part of any project. Fireproofing and fire stop systems not only are important for meeting codes, but also providing building occupants precious time to evacuate. 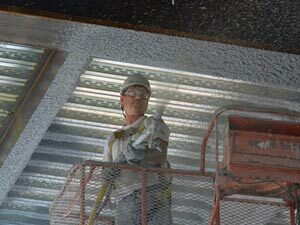 When you choose Arango Insulation for all your commercial fireproofing needs you can rest assured that you are getting nothing but the best. We offer products from Hilti and other trusted names to ensure the safety and integrity of your structure for years to come. Contact us today for more information about our selection of commercial fireproofing products and services and how we can be of assistance to you in Atlanta, Marietta, Kennesaw, Roswell, Decatur, Smyrna, and beyond. We also offer commercial insulation and commercial roofing.